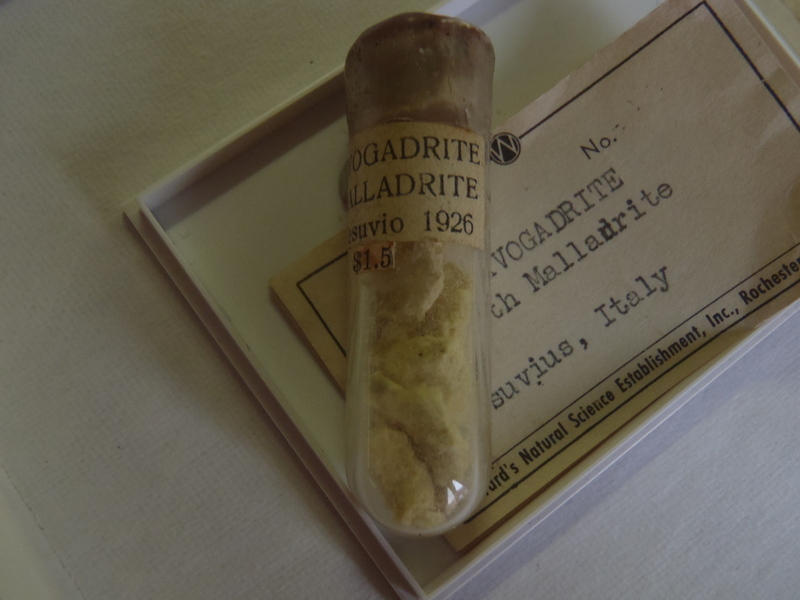 Malladrite: Mineral information, data and localities. After Alessandro Malladra (born in Turin, 1865; died in Rome, 1945), professor at the College Mellerio Rosmini-Domodossola; director (1927–1935) of the Vesuvius Observatory. 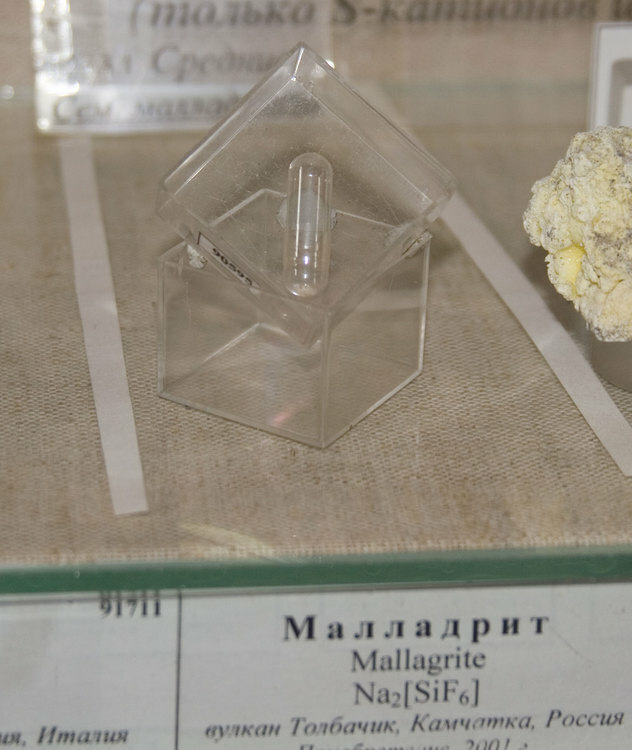 This page provides mineralogical data about Malladrite. Crystals prismatic  with basal plane and pyramid. Lava deposits on an active volcano. Avogadrite 2 photos of Malladrite associated with Avogadrite on mindat.org. Slightly soluble in cold water; slightly more so in hot water. Stolba (1872) Zeitschrift für anorganische und allgemeine Chemie, Hamburg, Leipzig: 11: 199. Bertrand (1880) Bulletin de la Société française de Minéralogie: 3: 57. Raiteri (1922) Reale accademia nazionale dei Lincei, Rendus, Rome: 31: 115. Zambonini and Carobbi (1926) Reale accademia nazionale dei Lincei, Rendus, Rome: 4: 173. American Mineralogist (1927): 12: 379. Collins (1929) Chemical News and Journal of Industrial Science, London: 318: 184. Carobbi (1933) Periodico de Mineralogia-Roma: 4: 410. Palache, C., Berman, H., & Frondel, C. (1951), The System of Mineralogy of James Dwight Dana and Edward Salisbury Dana, Yale University 1837-1892, Volume II: Halides, Nitrates, Borates, Carbonates, Sulfates, Phosphates, Arsenates, Tungstates, Molybdates, Etc. John Wiley and Sons, Inc., New York, 7th edition, revised and enlarged: 105-106. Acta Crystallographica (1964): 17: 1408-1412. Garavelli, A., Balić-Žunić, T., Mitolo, D., Acquafredda, P., Leonardsen, E., Jakobson, S.P. (2010): Heklaite, KNaSiF6, a new fumarolic mineral from Hekla volcano, Iceland. Mineralogical Magazine, 74, 147-157. Accad.Lincei.Rend.Cl.Sci.fis.mat.nat., Roma (1926) ser.6, 4, 171-175; Palache, C., Berman, H., & Frondel, C. (1951), The System of Mineralogy of James Dwight Dana and Edward Salisbury Dana, Yale University 1837-1892, Volume II: 99, 106; Lapis (1994): 5: 13-23, 58.